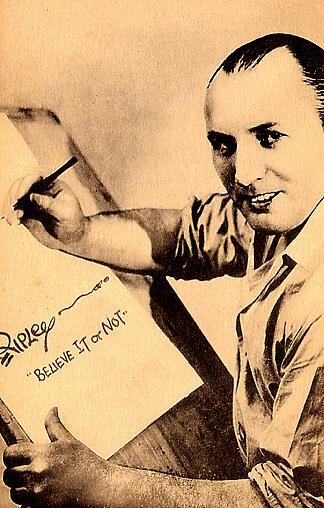 Robert Ripley published his first Believe It or Not cartoon in 1918 at the age of 25. Robert Ripley became popular at a time when America was fighting the 1st World War. Starting out as a cartoonist for The New York Globe in 1918, Ripley became the Ringmaster for a Circus of the odd and strange freaks of nature. Ripley and his entourage provided a reality check for a time sandwiched between two world wars and the Great Depression. 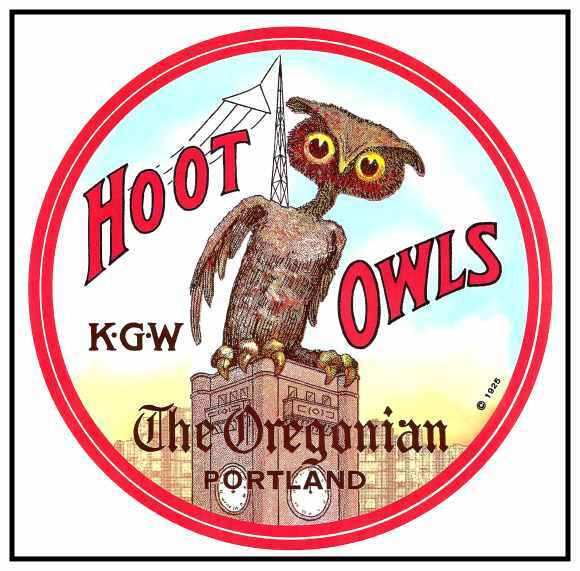 This subject is near and dear to me and it is becoming very collectible. 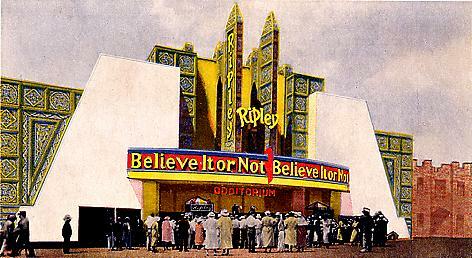 Ripley built a number of Believe It or Not Odditoriums including this one in New York City. Ripley drew cartoons of the strange creatures and “real people” that he spent his life seeking out. They were published in newspapers all over the world. In the days before television, Ripley, the ultimate showman, had a weekly radio show to reveal his exhibition of “curriodities”. He later filmed his show for theaters and eventually for television. 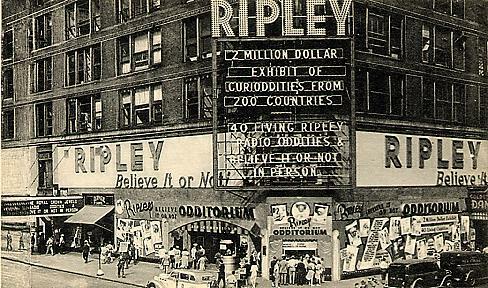 Ripley’s Odditorium at Chicago’s 1933 World’s Fair. 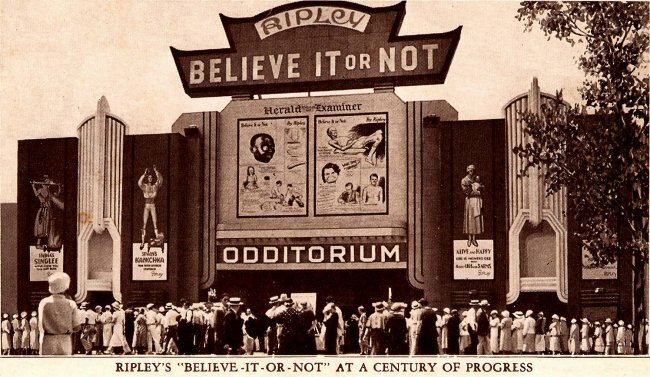 Ripley’s Believe It Or Not, as it later became known, has been one of the longest-running comic panels in history and it continues to fascinate dedicated comic strip readers with unbelievable facts from around the world. The illustrated panels are read every day in more than 37 countries including New Zealand and Norway. This Odditorium was built for the New York World’s Fair in 1940. Ripley died in 1949 at the age of 56. Oddly enough, Ripley Believe It or Not Museums are still popular today. 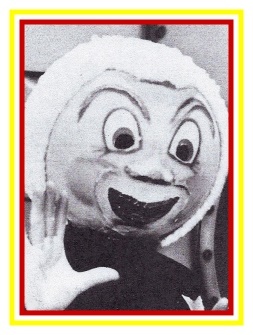 They show pictures or recreations of the oddities that Ripley was so famous for tracking down. He became a world traveler, living very extravagantly in his quest for the queer. 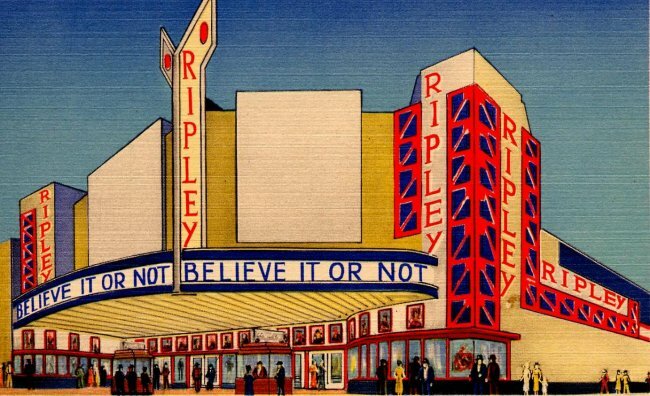 Ripley’s Believe It or Not still produces a daily cartoon published in newspapers across the world and they are published daily on the Web.